Bangor ‹ Series 9 ‹ Flog It! Paul Martin is joined at Bangor University by experts Mark Stacey and Adam Partridge. Among the items they value are an early tea caddy and a microscope. Browse content similar to Bangor. Check below for episodes and series from the same categories and more! unwanted antiques and collectables and then whisks you off to auction. to the test a little later on in the show. First, we need some antiques to sell, so it's off to Bangor. which separates the Isle of Anglesey from Gwyneth. boasting a cathedral, a university and a rich cultural life. gathering here outside Bangor University's Pritchard Jones Hall. when we put them under the hammer later on in the show. who enjoys both the antiques and the tales behind them. -Where did you get this from then? high and low for the right item to take off to auction. rummaging in a lady's bag like this? Coming up, Mark's got something rather enjoyable. classical scene, revolving round in sort of silver plate. They're having a really good time there. But unfortunately most of them are clothed as well, which is a bonus. And I find something top rate. I like that a lot. Yes, yes, I do. Isn't it super? pottery designer, Susan Williams Ellis. "What we want is a very smart coffee set." I thought, all right, I'll try and do one. in an old family trunk, which is full to the brim. -Is it going to be a treasure trunk today, Dora? Shall we have a look? I can't resist any longer. Well, we'll open it up here. There we are. Now, tell me about this lovely set. Well, my cousin bought it for my boys. And it was second hand. She bought it off somebody else whose children had outgrown them. Wonderful. Your sons were very well behaved children, weren't they? They had to be, we only had a small house! they all had to go back into the boxes. -really want to see, is these original boxes. because you never know what you're going to find in them, do you? Oh, that's wonderful, isn't it? Look, one of the little station units, what have we got here? And really in quite good condition. These are transfer printed on here. you know, they get scuffed, chipped and scratched. a long time. Why have you decided to sell it today? Well, I had three boys. and I'll sell it one day and they can have the money. And what are you hoping it might be worth? Do you have a specific figure in mind? Of course. I like your answer. -at an estimate of somewhere in the region of £150 to £250. More? Well, we'd always like more. How much more do you think it's worth? Oh, well it might make that but I think we've got to be realistic. -we'll chug into the station in first class. It's a lovely collection but I think Mark is right to be conservative. It looks like a watercolour. Adam has found some nice-looking silver belonging to Jim and Eileen. Tell us about this little cruet set? Well, we bought this about ten years ago in an antiques fair. and were rather taken with the design. It has a lot of nice qualities to it. and these are not engraved with any initials on any of them, are they? the saleroom that have the wrong spoons. They've lost their spoons. the same year as everything else. So everything matches, doesn't it? that's the only other question I have. -but it's a lovely set, isn't it? That's what I looked up. I checked it as well. Birmingham 1907.
who was in operation from 1901 to 1909, I had a quick look. So that all ties up very nice. So, ten years ago you purchased it. -Well, I did really. Yes. No, it was shared, it's one thing we agree on. One thing! You don't agree on much else? aren't they? What did you pay for them? Do you mind if I ask? I think it was about £150 we paid. Well, that's not too bad for a fair. I'd suggest a lower estimate. potentially losing £50, but that's the name of the game, isn't it? of getting the £150 you paid for it, which would be quite nice. commission, you end up with what you paid for. Yes, so we'd have broken even. That's right. We'll put these in the auction, 100-150. I'll have my fingers crossed that they do break even. These are nice. Parry and Webb? Yes, indeed, yes, but no-one's owned up to them sadly. What, they're just sitting here? Well, let's hope the owners turn up soon. which has caught Mark's eye. You've brought this rather nice brooch in. Is it a family heirloom? No, I actually bought it in a charity shop about ten or 12 years ago. -I just thought it was really pretty. It is. Dare I ask what you paid for it? -I think I paid about £5 for it. and then you've got a pointer or something like that, a hunting dog. It is actually nine-carat gold, did you know that? but I didn't know what year. Yes, it's stamped 375 at the back, which says nine-carat gold. I think a lady would like that on her hunting jacket or whatever. the texture of the hair on it. Is all this gold or is some of that silver? I think it's a mixture. metal which is not marked. It could just be that it was silver gilt that has come off. I think we've got to value it as a decorative piece of jewellery. -It's not going to send you to the Bahamas, I'm afraid. You might get to Prestatyn. Oh, right, I quite like Prestatyn, so that's fine. Well, you've had it for about ten years. After all this time why have you decided to bring it along today? Because I've never worn it, it's just been in the drawer. and wear it. I think it's a shame, it's very pretty. who likes that sort of thing would appreciate it. £70 to £100, something like that. because we don't want to sell it for nothing. the auctioneer 10% leeway on the day. Would you be happy with that? I don't wear it, I'd like somebody to buy it, wear it and appreciate it. and let's hope we get a lot of hunters on the day. That's a very bad joke! I can understand why Liz bought it. I liked the dog too. and we're doing it right here in this building. Roger Jones's auction room in Colwyn Bay. really nervous or really excited. That's auctions for you, it's a roller coaster ride of emotions. the toy collectors on the day. so the little silver cruet set will go to the highest bidder. have a good chance of finding a new owner for Liz's gold hunting brooch. of browsers at the auction house. Start at £100. 100, I'm bid. At 110. There's quite a buzz in the saleroom. Our auctioneer on the rostrum is David Rogers Jones. First up it's Dora with her wonderful Hornby train set. -And boxed up as well, isn't it? A good collector's item. 200 to 300? Good luck, Dora. Ladies and gentlemen, the Hornby Clockwork train set. A lovely selection of boxed rolling stock in lovely condition. There's a water tank, a large quantity of track. Everything is here for the model railway enthusiast. It's a great lot for somebody to invest in to start a collection. The Hornby Clockwork, lovely condition. Come on, they're not battered and flake, mint to good condition. Push me off at £200? £140. I'm bid at 140. At 140. 140. 160, 160. Is there 80? At 160. 160. 80 anywhere? At 160. Is there 80? -We want a bit more money than that, don't we? At 160. I would've thought this is a very, very cheap lot. At £160. 170. 170 bid. At 170. Struggling badly. No, we don't want to sell it. Has to be with owner's approval, if at all. £170. Doesn't want to sell. OK. 170. Any advance? Passed on at 170. The auctioneer was calling for £170. We didn't get it. We had a reserve of £200. I think you're right. Yes. Good on you for bringing that in, Dora. Oh, all right. Thank you very much. Next Jim and Eileen with the silver cruet set. We need someone with a posh bed and breakfast to show it off. A four-piece silver condiment set. All with Bristol blue liners and the nice twist handled salt spoons. The right spoons as well, wasn't it? So often they come without the right spoons. With me at £70. 70 I'm bid. 80. 90. 100. £100. At £100. Is there 10? £100 seated in the room. At £100. I'll take 10. Anybody new? I'll take 10 before they go. Anybody coming in? Final call at £100. and hopefully someone's going to use that as well. It is a practical thing to use. It is showy but practical. -I'm glad it didn't sell for too little. Hopefully it's gone to the castle down the road. I'm sure you use yours all the time. In fact there are about ten castles within 16 miles. Oh, lovely. Thank you for coming in. Here comes Liz's hunting brooch. and has dropped the reserve to £50. Liz, fingers crossed. It's going under the hammer right now. because that'll put the price up. the form of a shotgun with a gundog. A lovely bit of novelty jewellery. It starts with me at 60. £60 I'm bid. At 60, 70, 80, 80 I'm bid. 80. Come on, you've got to have this if you are a sporting type. At £80 only. Is there £90? Final call , £85. I'm bid. 90. 90 bid. You want five again? It's going then at £90. Yes. Thank you very much indeed. Well done, Mark. That sold at the top end of the estimate. Now something for all you pottery fans. I'm off to Portmeirion. Susan was an imaginative and multi-talented designer. her Botanic Gardens range in 1972. Her inspiration may well come from her love of horticulture. had nurtured Susan's gardening ambitions. to have a chat with her son, Robin Llewellyn. especially right here, your mother's favourite spot. I can see why. It's rapidly becoming one of mine. What did this mean to her? putting a bit of her creativity into Portmeirion. and in developing the formal gardens within the village. become an artist who was simply producing one-off pieces. elegant and functional pieces for daily use. I thought, I shall try and do one. It was something that nobody had done before. That was a tremendous success. the Portmeirion pottery brand with her husband in the early 1960s. such as Cypher and Totem. Those striking shapes are now iconic. The Botanic Garden is a classic and it has continued to flourish. That was when she wanted to do other things. Was she proud of that legacy? She was proud of it but she always thought, "Well, why can't people forget Botanic Gardens? "I want to design something else!" but thank goodness its success didn't dampen Susan's creativity. What was she working on, in her final years? or more of her life's work, was underwater painting. -Really? She took up snorkelling? At times she felt more at home in the water than she did on the surface. using a special crayon and a board. the colours and annotate the drawings. So it was quite a scientific process as well. But that was her passion, the underwater painting. the village she dearly loved. Leaving behind a wonderful legacy for all of us to enjoy today. Our experts are deep in their studies at the Pritchard Jones Hall at the University of Bangor. One of our owners gets more than just a financial reward at the auction. The condition made that sell. It was in perfect condition. -Your luck has changed forever now. Alun and Gwyneth have brought in a little treat for Mark. You have brought in this spectacular cup. -Is it a treasure of your family's? I'm representing here today St David's Hospice in Llandudno. This has been donated, really. It came in a box with lots of other items in this last week or so to our distribution centre. "This might be an item for Flog It!" -"I'll come along and see whether it is worth anything." Were you as excited as Alun when you saw this piece? I love the cup, I think it's beautiful. -It's a remarkable object, isn't it? -Is it a loving cup? No, it's not really a loving cup. I know why you say that because it has two handles. It is a remarkable looking object. revolving around it in silver plate. or gilt metal which forms the rest of it. I'm a little bit concerned about one thing. There's a little rim just underneath here which is plain. -I think that would have sat on a bigger base. I think it was probably done in the 19th century. the Empire period in France, but I think it could be a little bit later than that. I wouldn't be surprised if it was English. And possibly by a firm called Elkingtons. There are very few marks underneath. Some scratch marks. There is a little mark which has been partially obliterated that says "B". -And what a lovely thing to have donated. going along there, with all these figures. In various positions. They're having a really good time. so we will not get offended by them. for something like £150 to £200. And we'll put a reserve on it of £150. -we should get quite a lot of interest. and I look forward to seeing you at the auction. -Let's hope we can really raise a good amount of money for the hospice. It's always nice to hear of a charity benefiting from the auction. Next, Adam's enjoying examining a scientific item belonging to Gillian. -This is an interesting collection, isn't it? How have you accumulated all of this? and he gave me all this. Right. Excellent. Well, I think this is a nice little collection. which is a lacquered brass microscope. -About 100 years old now. Retailed by Baker of High Holborn in London. with your extra bits and pieces, accessories and lenses. I mean, these are fairly common, but the slides. -I nearly didn't bring those. -..slides come up, they're getting much more inquiries about. -I nearly didn't bring those at all. -Well, they've improved the value of this fairly significantly. Because this one on its own, without being rude, it's a fairly ordinary one. Yes, well, I thought that. and they're from all around the world. Yes, there seems to be different countries. In this one we've got insects. Quite easy. little micro-organisms of some sort. -..of great value these ones. No, I think most of these are the man himself. I think the value is mainly in these ones and these ones, that were purpose made. This one's from Santa Monica, from Venice, from Colombia. Coast of Dalmatia. Sweden. So there's a whole geographic selection here. We'd have to have a really good look through, and some are rarer than others. Not at all. No idea at all. I've never looked at them or anything. -and I would think these are worth similar amounts. -So you've got 150 to 250, probably. And it might go on. I wouldn't be surprised if it went on a bit longer. -So does that sound all right? -That sounds very good. Yes. I wasn't thinking they were worth anything at all. Now, why have you decided to sell them? I don't have time to look at them now, and they've been sitting at my mum's house for years now. -Right. So time to get rid. -They'll go to a collector, I'm sure. -Lovely. It would be nice if they were. If they made a few hundred pounds, would you have any plans for that? Doing things in the garden really. -Are you a keen gardener? and I'm making a vegetable plot, and doing, you know, my own little allotment in the back. Thanks for coming in and I really hope that they take off. I think they probably will. -We'll put a reserve of 150 just in case. What a fascinating collection of slides. Someone's going to really enjoy looking at those. Tea caddies are so collectable. They come in all various shapes and sizes, and different materials. but my favourite obviously are wood. and it's got a lot of paper scroll work on it. -Yes. Can you see that, where all the paper's folded up very neatly? -Well, I like that a lot. -Oh, I do. Yes. Yes, I do. That sort of 1815, 1820s. -And that would have been used in this country? Made in this country. Yes. Someone with a lot of money and a lot of quality and a very good eye would have owned this. -slightly at a later date. You see this gold leafing. It's not - to me, that doesn't look like gold leafing. which is probably put on in around the '40s or '50s by somebody. Then inside you've got this small lid. so the lid wouldn't drop down, and that would house your tea. This is a single blend caddy. Now some tea caddies are double blends. You can have green tea and black tea. You can have a large one with a bowl in the middle and mix the two blends together if you want. which is the amount of weight the tea was sold in. -Can you see there's traces of tin foil there and there? Well, that was all lined in tin foil to keep the tea fresh. a single blend, maybe a green tea or black tea. because tea was so expensive. It was such an expensive commodity. could really afford it, to start with in the 1600s. and by the 19th century everybody was drinking it. -But isn't it super? It's a lovely example. Whoever made this was a master of his genre, put it that way. -..has to spend a couple of hundred pounds on it. They have to spend 200 on it. it has cost them £600. They're going to be wanting to sell this for £1,200 maybe. And it will probably be worth that after a lot of TLC. I think the collectors will love this. Reserve at three but not a fixed reserve. Use a bit of discretion. -So it might sell at 280. And cuts the middle man out. Even needing restoration, it still looks fabulous. so it's time to move it on. which is pure quality and a beautifully crafted thing. Alun and Gwyneth are first with the classical cup. Let's hope this next lot is a real winner, it should be. It should be, shouldn't it? It's a trophy, for crying out loud. We want to hold it up high and say "Yes, we won." £200, top end of the estimate. That's the top end. We know you'd like to get the top end each time, but I don't know. It's a speculative thing. But I think it should make 150. I can't imagine you'd want it. Well, look, there's no accounting for taste. Someone here in this room will absolutely love it and they'll display it beautifully. We hope so, we need the money. -All proceeds to the hospice, anyway. Something very, very good quality about this. The quality of the figuring is brilliant. Six inches high. 200? It smacks of quality, doesn't it? 100, I'm bid. 100. 100, bid. 100, hope you're lucky. It's at the bottom though. 120, 140. Is there 60? 140, 140 bid. 60 anywhere? £140. I'll go 50, even. At 140. 150. We've got 150, so we've made our reserve. 150. I'm selling at £150. 60, a new bidder at 160. Worth every penny of 200, in my view. At 160. All done at 160 and going. -We're happy. It's gone within estimate. Well, that's £160 towards the hospice. Now, Gillian's been holding on to the next item for about 40 years. So let's see what she gets for it. -You must have had so much fun looking through those. -We could've sat there for hours. Shame we had other people to deal with. In a way, the interest is in the specimens. Yes, they're collected nowadays as well. Microscopes appear a lot. A lot of interesting styles, especially the named ones, the specially produced ones. I guess it's harder to pick up these early slides now. Yes. Always great demand for them. Also, it's a named instrument as well, so that's in its favour. -I'm not good at selling things. -Do you do not win things like raffles and lotteries? -I've never managed to sell things. Neither do I, but now's the time for Gillian's luck to change. We're going to find out, it's going under the hammer right now. Lights, lenses and a very nice parcel of mixed slides. It's all gone quiet, hasn't it? Start me at one and a half? 120, I'm bid at 120. We're back up there now. Online, the bidding now at 200. 200 bid. Is there 10 there? £200. 250, 250 bid. Online at 250. 250 bid. 250. We've got an online battle here. Is there 70? At £260? Online, the bid at £260. 70, if you like. All done? I think there might be a little tickle in this yet. It's gone very, very quiet. At 270. -I've never been to an auction before? 280. And again now. You could hear a pin drop. It's a baptism of fire, isn't it? Final, final call at 280. All done? Yes! That's a good result, top end of the estimate. We're really happy with that. Condition made that sale. Now, remember that beautiful tea caddy that I picked out earlier? Well, it's time to see what auctioneer David makes of it. Partially gilded, in good condition, that's well over £1,500. But there's a few bits missing. I've put £300 to £400 on this. who will take on the restoration of this, no question about it. We've had internet interest in it so it augurs well. Happy with the price? 300 to 400? and in fairness it's a fantastic bit of workmanship. It's an unusual tea caddy. As I say, tea caddies are all the rage at the moment. settle down into the chair and enjoy this auction. Well, it's all sounding positive. and hopefully for not much longer. -The auctioneer liked the lot as well. There's a great deal of work that's has gone into it. that's why we've got £300 to £400 on it. It's a wonderful thing. Have you had second thoughts? No, it's going towards our anniversary. We're going on a trip for our 50th anniversary. -Oh, congratulations. 50 years together. Wonderful. Where are you going? On a cruise. Not far, though. -OK. Not around Anglesey, a bit further. A bit further than that. Hey, look, good luck. Let's find out what the bidders think. Early tea caddy with filigree scrolls and filigree decoration. OK, it needs a bit of attention but it's a lovely, rare piece. 300, I'm bid. At £300. 75, if you like. At 450. I'm very pleased with that. Good tea caddies always sell well and that's quite a rare one. Even though it had a bit of damage. -That could be sorted out. That was on you. You take the credit for that. Not at all. I've just seen them sell for that kind of price before. The more you go round the block, the more you get to know, really! All of our owners have gone home and they've gone home happy. OK, there were one or two sticky moments but that's what auctions are all about. You get lots of highs and lows and lots of surprises. in North Wales, and all credit to our auctioneer and our experts. Everyone was on the money today. Until the next time, it's goodbye. Flog It! presenter Paul Martin is joined by experts Mark Stacey and Adam Partridge at Bangor University in beautiful north Wales. Among the items valued are a microscope with original slides and an exquisite early tea caddy. 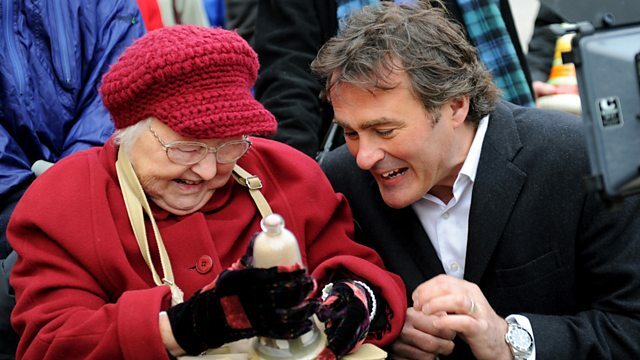 Also, Paul finds out about the creator of Portmeirion Pottery, Susan Williams Ellis.